The HTMS Chakri Naruebet has joined two ships already dispatched to the South to help recovery efforts from Tropical Storm Pabuk. 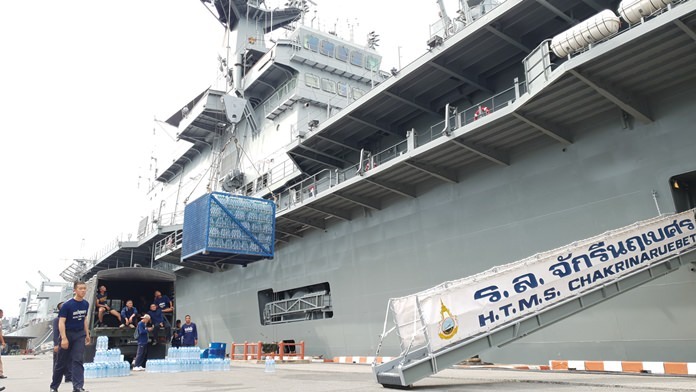 Thailand’s aircraft carrier the HTMS Chakri Naruebet has joined two ships already dispatched to the South to help recovery efforts from Tropical Storm Pabuk. The carrier, which no longer has any operational planes, was to be used as a platform and base for disaster relief in seven hard-hit southern provinces in the Gulf of Thailand and Andaman Sea. It was ready to steam out of Sattahip Naval Base Jan. 5. While it can’t support jet planes, the ship will be a deck for four helicopters. Other users aboard include divers, disaster-assessment teams, search and rescue squads, medical units and public relations officers.